Node tool has a new 'Transform Mode' which provides a containing box for the selected nodes and allows for more freeform editing of the nodes. Node and Pen tools have an utterly amazing Construction mode which gives easy access to common construction features to help you build complicated shapes or intersections accurately and easily, giving you simple access to parallels, right angles, reflected and mirrored angles, in addition to circular construction snaps and all construction intersections. This really needs a video to show how to use it - but it's awesome. Pen tool now has a 'rubber band' mode and also a mode to allow future curves to be added to the current object's curves (for example, the character 'a' is constructed of two curves in a single 'curve object' and this mode makes that construction simpler). Node tool can now auto-snap nodes if you drag a node from one curve over the top of a node from another (selected) curve and pause, it will offer to snap to the same geometry as the node you're hovering over (i.e. modify the on and off-curve nodes to match). This is really useful for trying to reconstruct areas of one curve from another curve. Node tool now allows for lasso selection of nodes by holding the Alt/Ctrl key and dragging a selection lasso. Pencil tool now offers a 'sculpt' mode that allows for extending or manipulating curves in a more natural way. More to come in this area soon. Many tools now allow for 'Alignment widgets' which you can toggle the visibility of in the context toolbar. When enabled you can visually adjust the alignment or even, for example, 'align to centre, snapped to the left edge of this object' by simply click/dragging. Fill tool correctly allows editing of skewed fill handles and newly-created skewed fills draw much nicer now. Ruler origin can be edited by simply dragging the area where the rulers intersect each other - it can even be snapped onto objects in the document. Guides can be edited in most tools by simply dragging a guide in the ruler area. Grid setup is now more interactive: origin can be dragged, axis scale adjusted and angle adjusted on-document, complete with snapping to objects and angles in the document to help you reconstruct useful grids from finished artworks or sketches. By enabling 'Edit in Plane' on the new Isometric Studio, tools can edit objects and appear to make those edits along the currently active plane - extremely useful for artists who enjoy working with any axonometric projections. You can now drag the rotation centre point (when enabled on the context toolbar) while holding Ctrl and it will translate the object - this is actually very useful for positioning and snapping objects relative to others. Shapes tools now have presets so you can create your own favourite shape setups and more easily use them again. New brushes, styles and assets are now shipped with the product. Visible bleed (accessed from the View menu) so you can more easily design into the bleed area - a common feature request. “Alternate futures” for document history have been added. Traditionally, if you roll back the undo history then do something else all your changes after that point are lost. Designer will now display a small branch icon in the history tab when you do this. Pressing that button will cycle between all the different “futures” after that history entry - meaning you will never lose work you have done. New 'Isometric' Studio makes it easy to setup and work with various axonometric projections within the application. HEIF images can now be loaded directly into Designer. If they contain a depth map, this will also be loaded as a second layer. Because depth maps are typically lower resolution than the main image, optional “smart” upsampling will be performed. Designer now supports custom document presets - a popular feature request. A new blend mode - Linear Burn - has been added. New “Move inside / outside” commands have been added - useful for quickly clipping/unclipping. New "Merge curves/Separate curves" commands. Grids now have an editable number of angle subdivisions. The Hard Mix blend mode has been improved. Numerous text improvements have been made - including new features such as bullets and numbering. Significant PDF import / export improvements and fixes. Added support for per-monitor ICC profiles (previously we only used the primary monitor's ICC profile) in the document view (controls still use the primary monitor's ICC profile, which will hopefully be fixed in the future). Designer 1.7 introduces a new “sub-brush” mechanism, developed in conjunction with Paolo Limoncelli (DAUB® Brushes). This exciting feature allows any brush to have a list of other brushes attached which will draw at the same time. Each sub-brush has a fully separate and customisable set of dynamics. You can control when the sub-brushes are drawn and how they blend with the main brush. Symmetry (up to 32-way) is now supported - including on-canvas controls and optional mirroring. Wet edges and accumulation are now available on colour brushes and brushes with HSL variance. Brushes with multiple nozzle textures have always chosen the nozzle at random. In 1.7, the nozzle choice has a dynamic controller and ramp for greater control. All pixel brush tools now support left and right arrow keys for rotation - a common feature request. The HSL adjustment layer has been rewritten. It now supports custom hue ranges, a new algorithm, new UI and picker controls. The Levels adjustment layer now supports output levels - a common feature request. The White Balance adjustment layer has been rewritten. The Selective Colour adjustment layer has been rewritten. PSD import / export of adjustments has been improved. The Vibrance adjustment layer has been rewritten. The Recolour adjustment layer has gained a lightness slider. Numerous other bug fixes - too many to list! Do windows 1.7 versions of AP and AD get performance improvements as their macos counterparts? No problems during instalation and runs smootly. Installation was working well without problems. I like the new icon and the image what will be shown at start up. Can't sit on my chair anymore and can't stand for the Mac version to come! The Mac customer betas for Designer and Photo have been out for several days now. Look in the Designer Beta on Mac forum (and the corresponding one for Photo). Icons I seen them but the splashScreen remind it's time to drink some yogurt. @walt.farrell This is much newer than Mac version I believe,unless I got it wrong. The Windows versions don't support GPU acceleration currently. Er... Didn't try the beta yet, but AFAIK version 1.6 does. Does this mean that 1.7 will be slower than 1.6? Please explain, thanks. Er... Didn't try the beta yet, but AFAIK version 1.6 does. I guess @rubs means setting you can choose in "performance" settings where you can choose your GPU as renderer. That may bring to mind acceleration. Anyways - is the acceleration planned at all for PC version? Ah. Right, that setting is just for presenting the document to the screen, the work of rendering the content is still done on the CPU. We do have plans for GPU acceleration, I have started it, but the trouble with Windows is, there is far greater variation in potential hardware, in comparison to the macOS ecosystem. Ah. Right, that setting is just for presenting the document to the ﻿screen, the work of rendering the content is still do﻿ne on the CPU. We do have plans for GPU acceleration, I have started it, bu﻿t the trouble with Window﻿s is, there is far greater variation in potential hardware, in comparison t﻿o the macOS ecosystem. 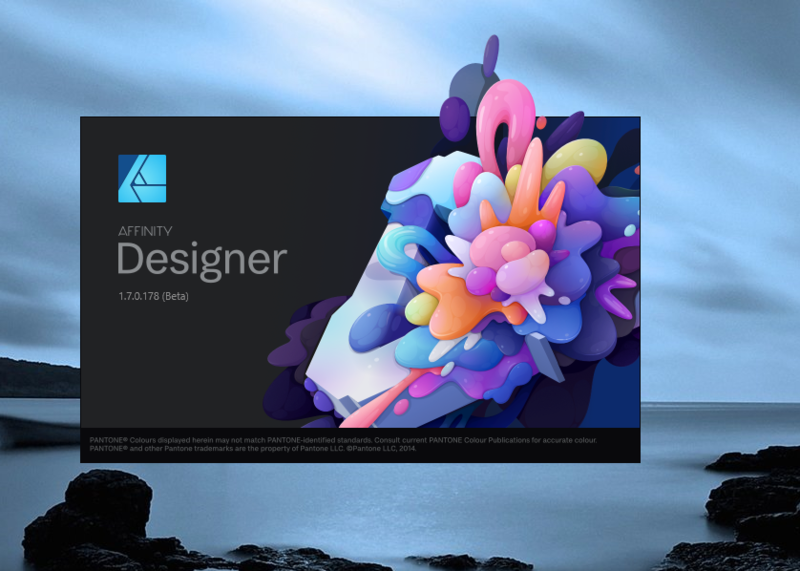 As far as I know the beta Designer and Photo builds should be quite close between Mac and Windows, though not using Mac I have no way to be sure. But people have been, for example, talking about the icons ever since the Mac betas were provided on Thursday of last week. Thanks for the new version But I have to wait another year for live/non destructive mesh warp, distort & psd editable text export. Can't wait to check these out (slow download at the moment for some reason). Highly recommended open source screen capture software (useful for bug reports). So, ... IS there a video yet? Sounds interesting, but I can't really imagine how it would work. Just a follow-up. Actually it took about 30 minutes. The download speed varied wildly during the download.